I am so pumped for this give away, guys. SO PUMPED!! Anyway, when I found out she was releasing a book, I knew I had to pick up a copy! Thankfully, I’m back from Australia or things would have gotten ugly. AND, not only do I have a copy but one lucky reader can win a copy too!!! Just leave a comment below and I will randomly pick a winner on Friday when I officially post a review of the cook book (spoiler: I love it). I know I’m sort of doing things backwards here but following convention is boring. So instead, I will give you a teaser recipe from the book, Oatmeal Cookie Granola. This granola is addicting and because I refuse to buy boxed cereal even though I love it, I’ve sort of just been eating this with fruit and milk in a bowl. You could get fancy and make it into a vegan parfait, maybe top off some oatmeal with it but seriously bowl + milk + this granola = total awesomeness. from Seriously Delish by Jessica Merchant, released here with permission. 1. Preheat the oven to 325 degrees F and line a baking sheet with parchment paper. 2. In a large bowl, whisk together the oats, almonds, flaxseeds, brown sugar, cinnamon and salt. 3. Heat a small saucepan over low heat and add the honey (or maple syrup), brown butter (or melted Earth Balance), coconut oil, and vanilla extract. Stir until the liquid is warm and the ingredients have melted together. Remove the pan from the heat and pour the mixture over the oats. Stir it with a large spoon to coat and bring the mixture together. Spread it evenly over the parchment-covered baking sheet. 4. Bake for 10 minutes, then use a spatula to toss the granola. Bake for 10 minutes more and then toss again. Bake for an additional 10 minutes, tossing twice during the cooking time. Remove the pan from the oven and let cool for 5 minutes. 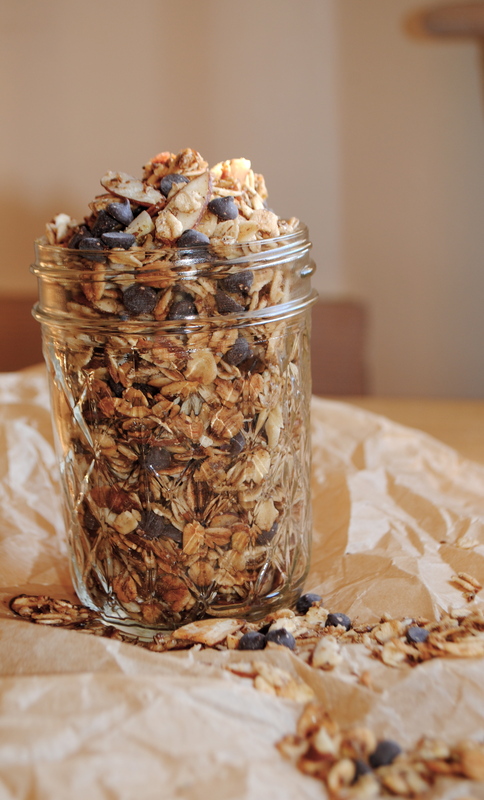 Sprinkle the chocolate chips over the granola and lightly toss. Let the granola cool completely on the baking sheet. Notes from the book: Allowing the granola to cool before storing it is the key to getting granola “clumps”. 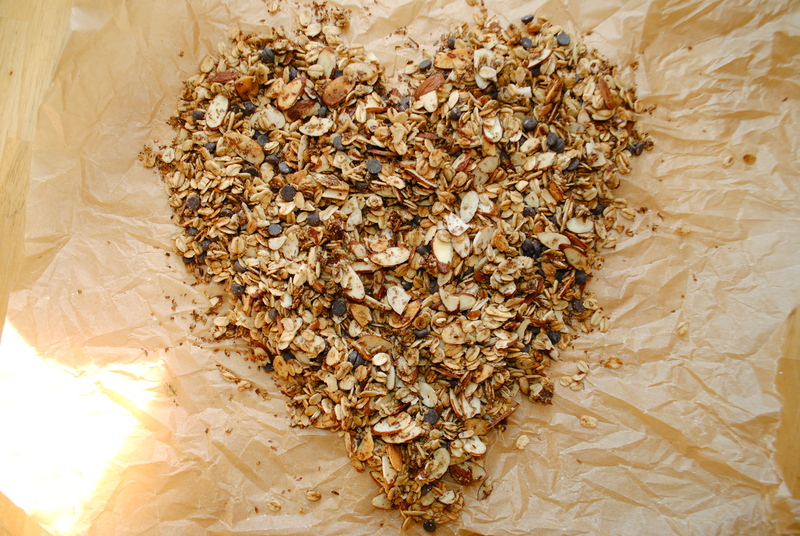 to help the clumping process, you can squeeze together handfuls of the granola once or twice during the cooling process. Store in a sealed bag or container for up to 1 week. Now, leave a comment below letting me know you are interested in winning the cookbook. I will announce the winner on Friday. And tune in tomorrow and Friday for another recipe and an official review. 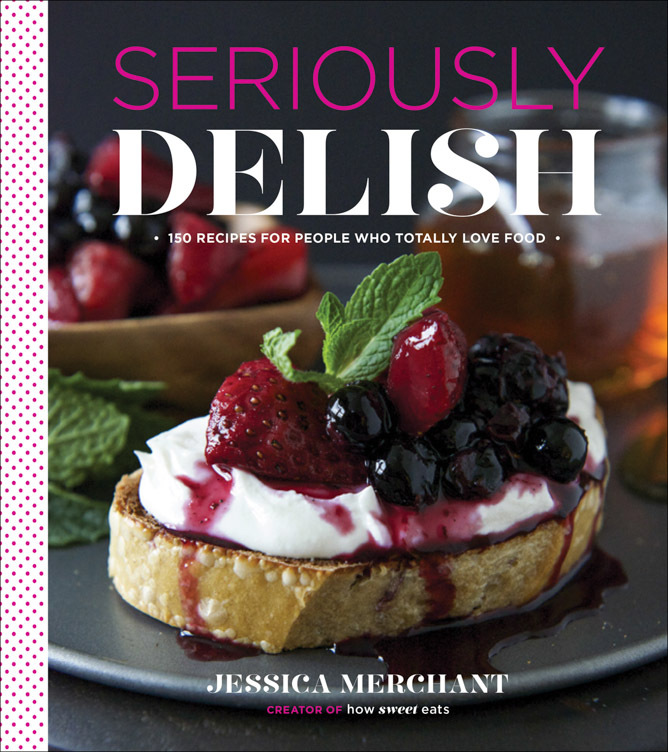 Also, if you are a fan of How Sweet It Is, Jessica is doing a book tour to promote Seriously Delish. You can get the deets here. Maybe I’ll see you at the Boston signing! The granola looks delicious! Thanks for the chance to win. Oo, looks awesome! Excited to possibly win! Looks like a great cookbook! Thanks for the giveaway. I’ll have to check out her blog now. Congrats, Sue! You won the cook book 🙂 Can you send me an email at wickedveganblog@gmail.com so I can get your info. Thank you! ooo giveaway! count me in! drool….I MUST make whatever that is on the cover! the blueberry salsa lady!!! i want it.